Check back for updates each week through the summer. We'll be talking about books for teen readers - the first couple of segments have been posted online. Going to extremes. Today we hear about a few books that are sure to get your heart racing. Lovely article in today's Times Colonist about Karen. It's getting so exciting! We will hear this week whether Karen has made the team and will be Beijing-bound! 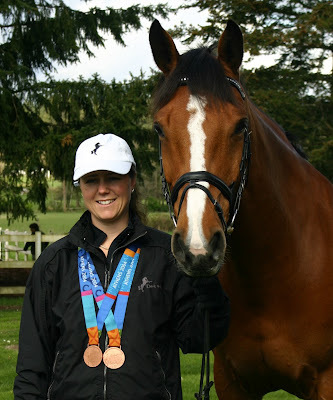 Saanich horsewoman Karen Brain is a world-class competitor whose training is on target for competition in Hong Kong this summer, a city that will host the Olympic and Paralympic equestrian events. Only one small obstacle remains: Though she has earned the required five qualifying scores, she has to wait until June 4 to learn if she has been selected for the Canadian dressage team at the 2008 Paralympics, Sept. 6-17. Considering the much larger obstacles she has already overcome, it is no wonder that Brain feels optimistic about her chances. Brain represented Canada in the three-day event at the 1998 World Equestrian Games in Rome. When she was long-listed for Sydney in 2000, it was only the sudden lameness of her talented horse Double Take that kept her from the Olympics that year. Author Nikki Tate, right, has written a book about Paralympic equestrian Karen Brain. It is named after Brain's favourite horse, Double Take, and chronicles the young rider's remarkable recovery from a catastrophic accident. The biography is written to appeal to all ages. Determined and positive, she began working with new young prospects, her eye trained on the next Olympics. But in September 2001 she fell from a young horse, breaking her back. Suddenly, even walking again was doubtful. Seven years later she is preparing to compete in her second Paralympics. Brain brought home two bronze medals from Athens four years ago, competing on a borrowed horse. This time she is training her own 12-year-old Dutch warmblood mare, VDL Odette, for the Beijing Paralympics. Nikki Tate, friend, author and biographer of Brain, first met her when Brain coached Tate's daughter more than 10 years ago. Tate followed Brain's story when she "went off to take on the world." Because she was in Ontario on a book-signing tour when Brain had her accident, Tate went to visit her in the Ontario hospital. To her surprise, there was Brain, paralyzed from the waist down and in a wheelchair, being picked up to give a riding lesson. Tate was in awe. "Such high spirits -- determined to battle on." The motivation to write Brain's biography was clinched when Brain went off to Athens in 2004 to compete on the Paralympic team. Tate said, "This is a great story and more people should know about it." I caught up with Brain during a one-week window when she was in Victoria. She had just returned from two months of showing in California, and was preparing to move to Langley for four months of training with coach Leslie Reid, a highly regarded Canadian Olympic team member who is also going to Hong Kong. "My training progresses uphill," Brain said. "I have made some good improvements with my horses. I have four months now. In my two months [in California], I made good progress, now I have double that time." Brain also has to attend to her equine partner's mental health. VDL Odette was imported from Holland to Ontario when she was six, and Brain got the mare two years later. 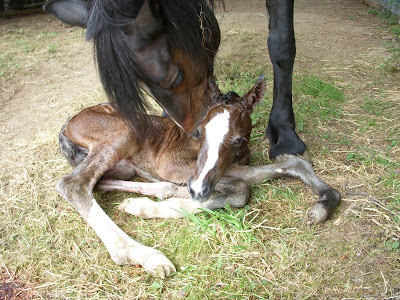 One challenge will be to sort out the cycles of this sensitive mare, as she has quite a physical reaction when she is in season (receptive to breeding), perhaps because of her earlier life as a broodmare. Brain will road-ride every day before schooling in the ring, because her mare likes it. As Odette does not like ring work that much -- apparently she is sensitive and has an opinion -- Brain likes to start a training session with something the mare does like. Brain and Odette have the potential in Hong Kong to win three medals. Will she win gold? As Tate says, "Never count her out. She will rise to the challenge and give it 110 per cent." Brain could win a medal in the individual competition and in the Kur freestyle event (a choreographed piece set to music), and she and her teammates could win medals in the team competition. Don't be surprised if an updated biography of Brain appears in the future. As Tate says, "There are great chapters to come." And, she points out, the subplot of this remarkable rider's accomplishments is that Brain hopes at some point to make a bid for the Olympic team. Her attitude, her determination and her willingness to do the hard work are all on her side. While the Paralympics organization pays some costs, training and showing a horse at the international level is an expensive venture. If you would like to help Karen Brain achieve the next step in her dream, please go to her websiteto contribute.